Welcome to the breathtaking Waterford Tower condominiums. Panoramic views of the Columbus riverfront skyline view right off your own private balcony. Just minutes away from the Business District, Nationwide Arena and Theater Districts, find yourself among downtown Columbus hot spots. Conveniently located, these classy condos have much to offer. Services at the Waterford Tower condominiums are unbeatable, with everything from concierge, food delivery, dry cleaning and a loading dock with freight elevator for easy moves to a complete business center. The Waterford Tower condominiums offer open floor plans with immaculate updates. Kitchens are a chef’s dream with long granite countertops, custom cabinets, and professional grade appliances. Enjoy your penthouse-like view with glass walls, large windows and a master suite built for luxury. Relax in your spa tub or marble walk in shower. In addition, stay warm by your gas fireplace as you soak in the city skyline. With tons of storage space including built in bookcases, these spacious condos are a must see. Amenities at the Waterford Tower condominiums include garage parking, fitness center, indoor pool convenient for anytime of the year, outdoor deck with hot tub, party room plus much more. 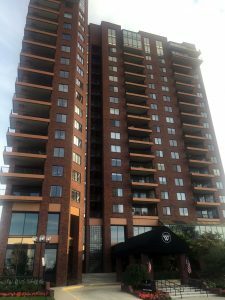 Come check out the Waterford Tower condominiums today. Contact My Columbus Condo for more information.